It was a hot August afternoon. I was walking home from work when a strange minivan pulled up behind and started following me. I’d pulled off my shoes and socks as soon as I got out the hospital’s revolving door, stuffed them in my backpack, and stepped onto the damp earth of some nearby grass. I had enjoyed the instant grounding, a human being again, blinking in real sunlight after a day of walking long corridors under fluorescent lights. I was sniffing the breeze and hearing birds again. And now I was being followed by a minivan in broad daylight. “Excuse me, sir?” It was a woman driving the minivan. She was motioning me to her window. I looked around. Women never do this. “Do you need some shoes?” she says. The woman gave me a blank look, which changed to an expression of deep concern. Hello. My name is Jeff. (Hi Jeff.) I’m a barefoot walker. I also run barefoot, but that’s another story. 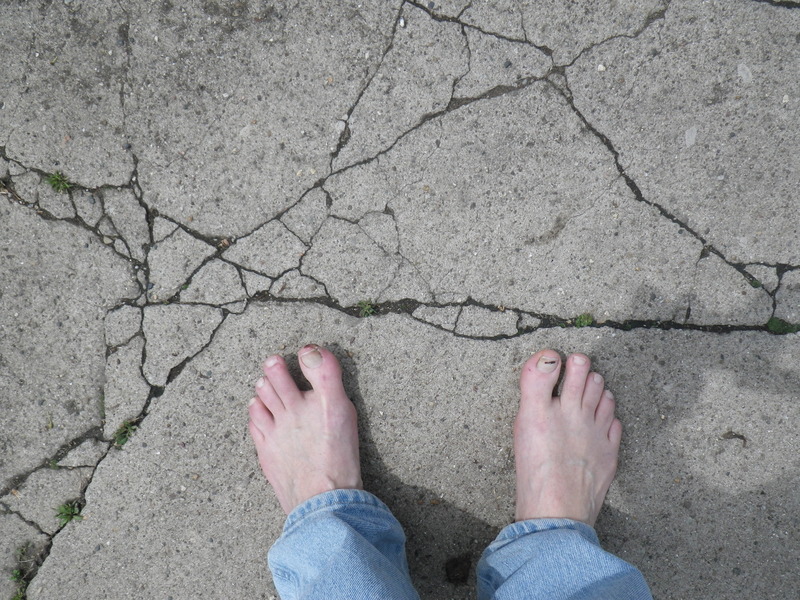 Walking barefoot has revealed a lot to me about the hidden rules of our society. Rule 74: You have the right to bear a truckload of firearms, text while driving, listen to talk radio, and other crazy stuff. But you do not have the right to walk barefoot in the city. Try it sometime. You’ll encounter the resistance. A mother watches me suspiciously as I walk past her toddler on the sidewalk. The toddler is wearing fifty-dollar Stride Rite shoes. The toddler smiles at me. The mother does not. Only one person got it. An elderly black woman dragging a trash barrel to the curb straightened up and watched me approach. She looked at my feet, smiled and gave me a knowing look . “Mmm hmm,” she nodded, “I know about that.” My heart opened as I walked away, recognizing this rare and deep connection with a total stranger. I was astounded. For those brief moments, with each step, I felt met by the Earth. Supported. Held up. I was walking in the street — by the curb on Lindsey Ave. amid the beer bottles and sodden Newport Menthol packages — but under all that battered asphalt, iron and heaving concrete awaited the Earth. Ancient and alive, it seemed. I looked around. Had anyone noticed me standing still in the street holding a bicycle? People have a low tolerance for contemplation around here: I once was down on my knees looking at a tiny blue flower poking through the sidewalk. When I looked up several people were staring at me unsure whether to call the police or an ambulance. Folks around here saunter, strut, shout and curse in the middle of the street all the time. That’s normal. What’s not normal is a white guy in dress pants standing in the the street looking at his feet. Anyway, I was hooked. The next day I left the bicycle at home. I had recently read Born to Run, the 2009 bestseller that sparked a shoeless revolution in the running world. So after work I peeled off my shoes and socks for the walk home. 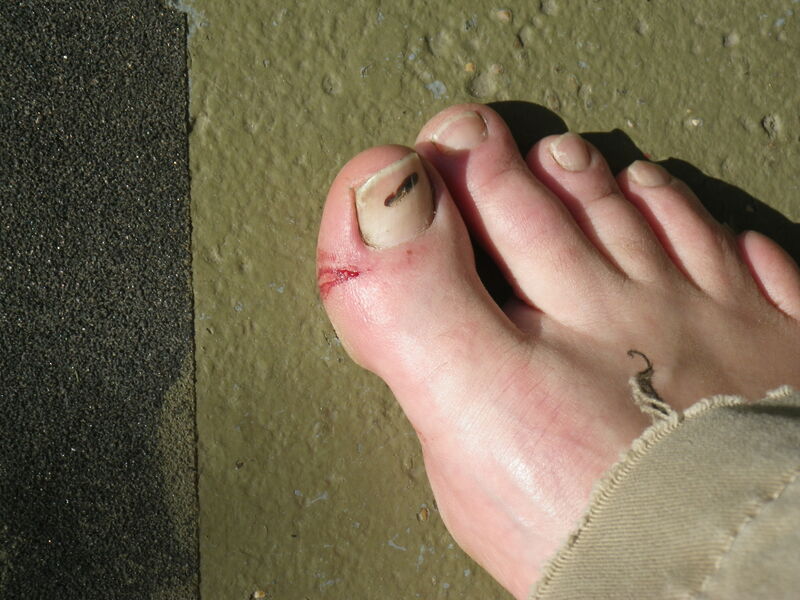 My tender, overprotected pale soles met real earth, pebbles and concrete- ooch eech ouch– and the first hundred yards exploded with sensation and stimulation. But then a funny thing happened, as if my brain was adjusting the volume of sensory signals down to a more reasonable level: the tenderness largely went away. I began to recite the walking meditation and experienced the same earth-rising-to-meet-my-feet. 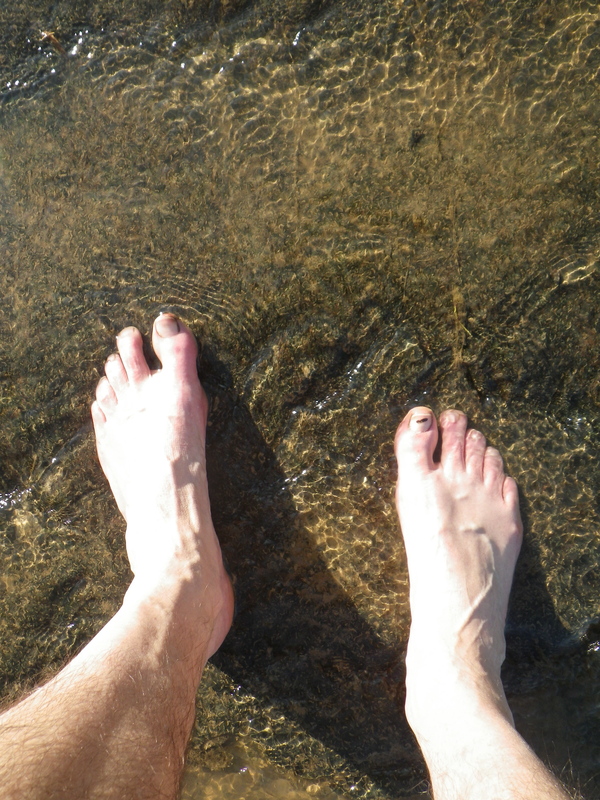 But in bare feet I experienced particular textures, objects, temperatures and dry/dampness. Yes, you say, I know all this. Concrete is hard, grass is soft. Big whoop. But you don’t experience it, do you? Ever? The difference between knowledge and direct experience is, Oh look: a mud puddle to stomp in. (Mud skooshes between my toes.) God, I haven’t done this since I was nine years old. What’s different as an adult is the conscious yes of connecting directly with Mother Earth. In seminary days I learned that the biblical name Adam comes from adamah, ancient Hebrew for earth. The “Adam” in Genesis (from the Hebrew, ha adam) translates straightforwardly as earth-creature. I get it now. As the native American medicine-wheel prayer teaches, humans embody the seventh direction: spirit and earth, mother-earth-walking. Barefoot walking is a simple, convenient, heart-opening spiritual practice that uses our feet as connective soul bridges between body, mind and planet Earth. 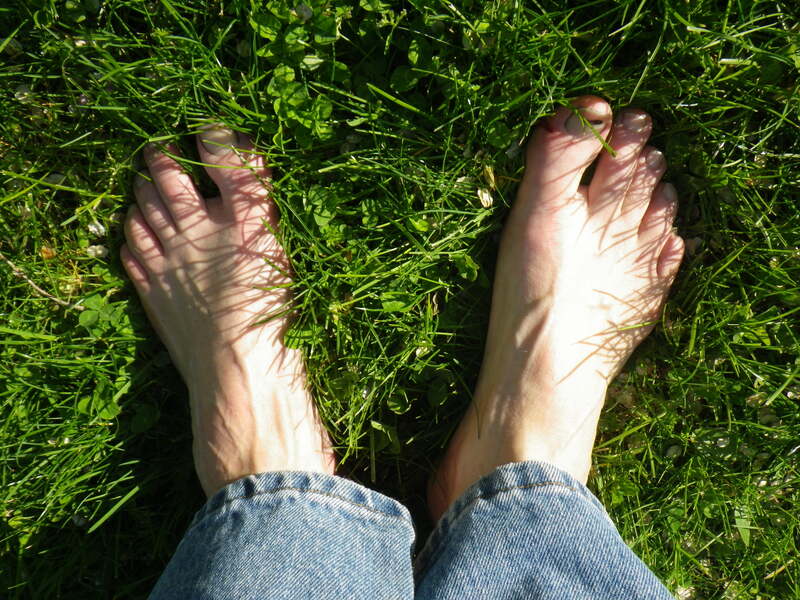 Barefoot walking with mindfulness raises consciousness. And raising consciousness in urban life is critical to sustaining the planet. Okay. 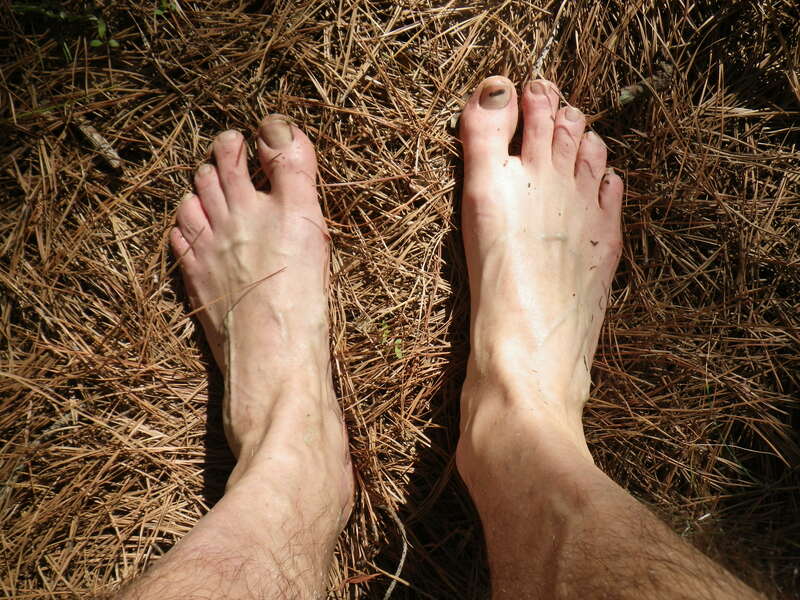 I wrote this to share the enjoyment, but also to address three common reactions I get from people about barefoot walking (or running). Don’t you step on glass/nails? 1. No. 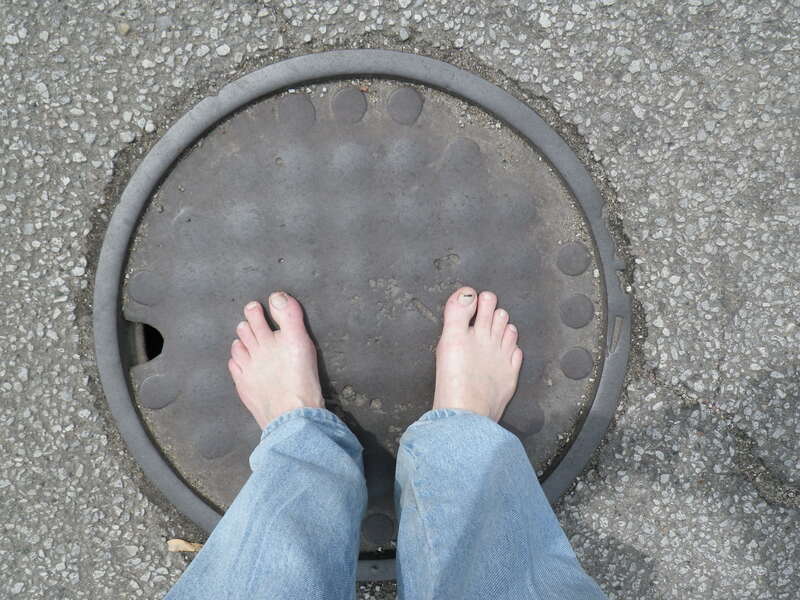 Because when you walk barefoot you have to watch where you’re walking. You really have to pull your attention atoms back into your body and concentrate on your surroundings. This is a spiritual practice: presence. “Just this. ” Not chatting on the cell, planning a meeting or daydreaming. 2. Yes. I do occasionally step on sharp or hard objects. In the inner city I probably step on tiny pieces of glass all the time. 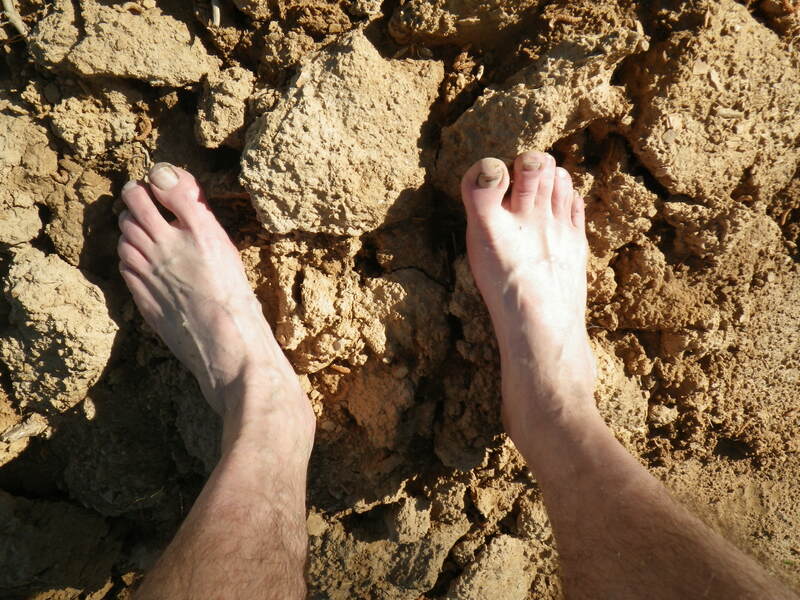 But here’s the thing: when you walk barefoot regularly, your feet get tougher. You don’t get cut by the little stuff. You see the circular wisdom. Tender, shod feet stay weak and vulnerable. Bare feet get stronger and more resilient. Our bodies have a natural immune system that existed long before antibiotics and big Pharma. 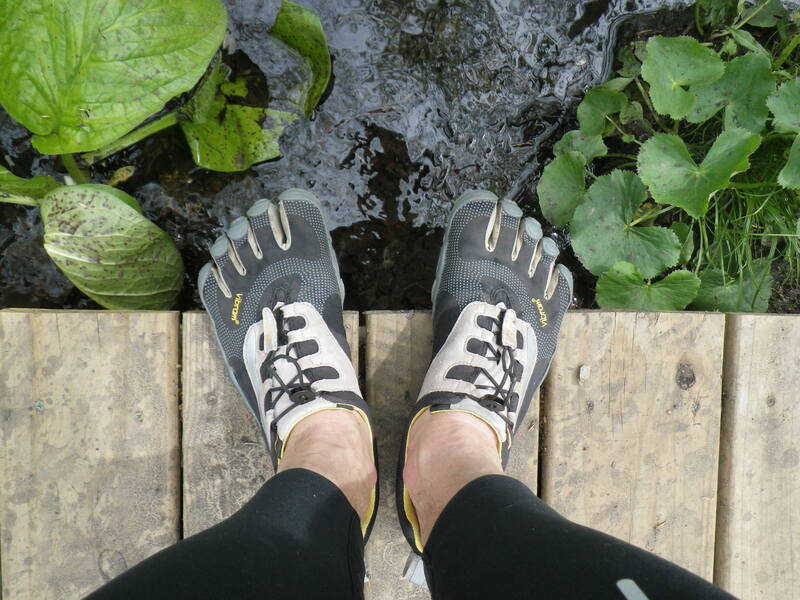 Similarly, we have a natural foot-protection system that existed long before orthotics and padded shoes. For example, when I’m running trails and step on an unseen root or sharp stone my foot instinctively collapses over the stone like a pizza dough dropped over a rock and my weight shifts to the other foot. This split-second correction is local: it occurs at the foot level. My “mind” has nothing to do with it because it happens too fast. But wearing padded shoes deactivates this localized foot-intelligence and results in dull-minded weak feet. The modern foot is just sad. It is like those feeble egg-industry chickens that live flightless lives in wire cages just to lay thin-shelled eggs for us and die. One barefoot colleague calls most shoes “plastic foot coffins”. 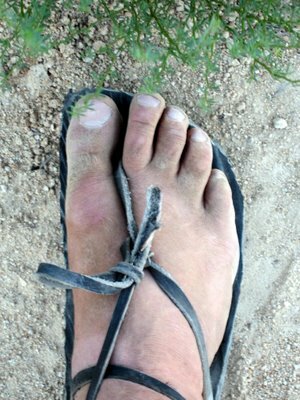 Conversely, the most amazing feet I’ve ever seen were those of a Ugandan hospital patient I worked with, a woman whose barefoot village lifestyle gave her powerful, splayed, muscular toes, calves of steel and soles so thick she could walk on gravel with a load of water or firewood that would cripple most Americans. Yet her feet were not hard, cracked, injured or scaly. They were pliable, lustrous, alive and beautiful. The worst feet I’ve seen? Every day: the grotesque pale, inflamed, blistered, bone-skewed joints I see in American women’s feet after years of walking in dress shoes and heels. That‘s weird. BTW: There is an entire field of valuable body/energy work involving pointed pressure to the soles of the feet called reflexology. You’ve heard about this. As a massage therapist, clients ask me about reflexology all the time: do I believe in it? Does it work? Sure it works. But you don’t have to pay a certified Reflexologist to experience deep sole-work. Just try walking around barefoot for a while on varying surfaces. Its a free reflexology session from Mother Earth. Won’t you hurt your feet?/ I have bad feet. In the bestseller Born to Run, author Christopher McDougall visits the Tarahumara, an indigenous Mexican people known for their mythic ability to run distances of 100 miles or more wearing only thin sandals. ** By comparison, McDougall notes the explosion of U.S. foot, knee and hip injuries since the 1970’s, when Nike began marketing the modern padded “waffle shoe” to runners. These new heel-lifting shoes altered the gait of runners by forcing an unnatural heel-strike landing that sends a whopping hammer impact up the skeleton to the skull with each step. We consider this whap-whap gait normal now, having forgotten how lightly we ran as children in bare feet. McDougall’s message: if you want to heal foot injuries, take your shoes off. Allow your feet to use all the available structures (26 bones, 33 joints and more than a hundred muscles, tendons and ligaments) for walking and running. Like the full power of your calf muscles to smoothly lower your heels to the ground with each step. But you have high arches, you say? Good! So do I. The arch is the foot’s natural shock absorber: the higher, the better. An arch is the strongest structural design known to builders from Ancient Rome to the St. Louis Arch. The stone blocks of a well-built archway, or the snow blocks of a family-sized Eskimo igloo do not even need connective mortar to work. Yet the best way to weaken an arch? Push it up from below (i.e. arch “supports”). You begin to see the power of the shoe industry to bend common sense and even biomechanical function right out of our lives. Money is made on shoe sales and painful feet, not strong and healthy feet. A “high” arch is a problem only for the ill-fitting products of standardized dress- and athletic shoe companies. There’s a deeper question in all this barefoot talk, I think. The issue is not, won’t I step on something painful or icky. The deeper question is, won’t I step on the Earth? The shoes that distort our bodies’ feeling and function also disconnect us from the earth. We do not think about this, working in our offices behind non-opening windows, perched high above the earth in steel-girder structures encased in concrete. We sleep and move in climate controlled homes and vehicles where we have to look at an instrument to know the temperature outside. There’s more of submarine or spaceship about our lifestyle than mother nature, it seems. Conversely, there’s something primal, damp, sensual and connective about walking on the earth. Something of mystery. This is the thing I love about it: it redirects my abstract concerns. It plugs my attention into something much greater and more live-giving than the ridiculous flock of worries my mind generates. I stumble out of my back door in the morning, half in the dream world and half hounded by the storm of anxieties rising in my head. But the minute I get my feet on the ground in the backyard? Bam. Here! Now! Aho! Plugged into real time. The flock of distractions disappear and then there I am, surrounded by What’s Really Going On: a rising sun, a biting wind, a cloudy sky, barking alley dogs, redbud blossoms, dew, snow, frost, the damn woodchuck eating my flowers, unmowed grass. Mushrooms over here; dog turds over there. I’m alive, in nature and participating in it. Just another creature, ha adam. Connected to the Source like all the other creatures above and below. We get so alienated from the natural world that we can forget how to recognize a close friend when it is lying right under our feet. We are like some of my inner city neighbors who never come outside or answer their door, isolated behind covered windows and receiving their information only from television and cell phones. We’re at a real crossroads now with mother earth, and need to change our relationship to her. Recycling newspapers and buying hybrid cars isn’t going to do it, because the mindset behind these well-intended changes still treats the planet as a commodity, a sort of gravel pit of resources for humans to plunder. We don’t need different ways to pillage the planet. We need different humans. A more evolved humanity that sees the ecological and spiritual implications of living as creatures in a much greater web of life all around us. 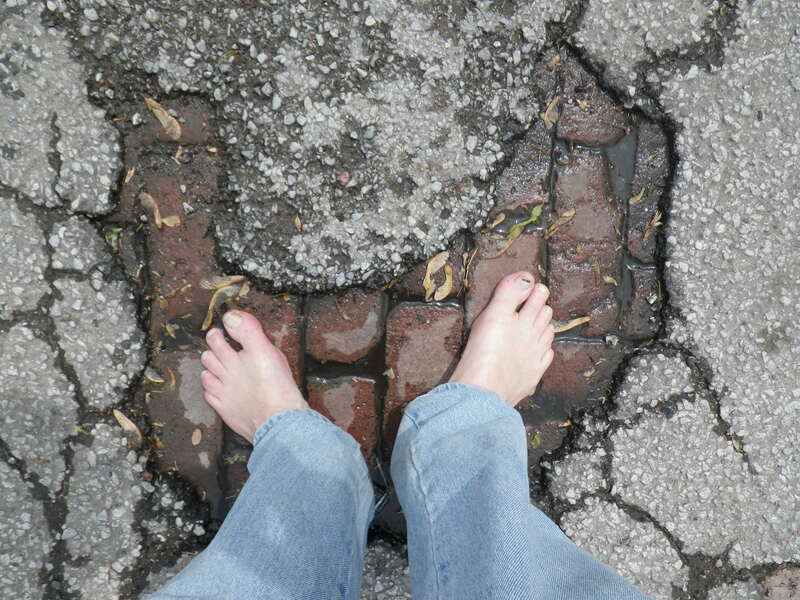 Fortunately, the treatment for our nature-dissociation is right underneath our feet. Reconnecting with the earth from which our food comes, the four legged and the many legged, the winged ones, the waters, the mineral spirits, the life. When you open an I-Thou relationship with the earth, you learn there’s a lot more underfoot than glass and bacteria. There is a lot of trash and trauma on the earth. And this is painful and necessary to experience firsthand with every barefoot step. But there is also a living spiritual connection to our Source, and all our relations. That real estate out there? It can heal you. So. Take your shoes off, go for a slow walk, and prepare to be amazed.